Equipment is provided for free during this event and can be kept if you sign up for a Learn to Play/Learn to Skate session. If you do not return equipment you will be charged the fee for Learn to Play. 1. If player is injured prior to the start or within the first two weeks of this session and will be unable to participate due to injury, the club will issue full refund. Doctor’s note proving that injury sustained will keep player out for the session will be required for refund. Refunds for withdrawal due to injury sustained two weeks after session start will be at the discretion of the Board of Directors. 2. Any withdrawal after the session begins is considered a voluntary decision and no refund will be granted unless item 1 above is in effect. Any outstanding registration fees will require full payment. Failure to pay will result in placement on the Missouri Hockey “no pay” list. 3. 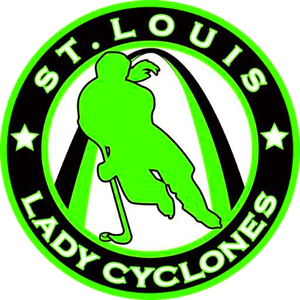 Failure to pay any outstanding balance to St. Louis Girls Youth Hockey Association will result in participant not being allowed to register for any Lady Cyclones sponsored team, clinic, or evaluation until payment is received in full. Any player with outstanding balance from any season of play as of June 1st will be reported to Missouri Hockey and placed on the MO Hockey “no-pay” list. 4. Any fees not paid in full by advertised deadlines may result in a late charge. 5. Any and all refunds are subject to St. Louis Girls Youth Hockey Association Board of Directors approval and discretion. The decision of the Board of Directors will be final. 1. If player is injured prior to the start or within the first two weeks of this session and will be unable to participate due to injury, the club will issue full refund. A doctor’s note proving that injury sustained will keep player out for the session will be required for refund. Refunds for withdrawal due to injury sustained two weeks after session start will be at the discretion of the St. Louis Lady Cyclones Board of Directors. 2. Any withdrawal after the session begins is considered a voluntary decision and no refund will be granted unless item 1 above is in effect. Any outstanding registration fees will require full payment. 3. Failure to pay any outstanding balance to the St. Louis Lady Cyclones will result in participant not being allowed to register for any St. Louis Lady Cyclones sponsored team, clinic, or evaluation until payment is received in full. Any player with outstanding balance from any season of play as of June 1st will be reported to Missouri Hockey and placed on the MO Hockey “no-pay” list. 4. Any fees not paid in full by advertised deadlines may result in a late charge. 5. Any and all refunds are subject to St. Louis Lady Cyclones Board of Directors approval and discretion. The decision of the Board of Directors will be final. 1. If player is injured prior to the start or within the first two weeks of this session and will be unable to participate due to injury, the club will issue full refund. Doctor’s note proving that injury sustained will keep player out for the session will be required for refund. Refunds for withdrawal due to injury sustained two weeks after session start will be at the discretion of the Board of Directors. 2. Any withdrawal after the session begins is considered a voluntary decision and no refund will be granted unless item 1 above is in effect. Any outstanding registration fees will require full payment. Failure to pay will result in placement on the Missouri Hockey “no pay” list. 3. Failure to pay any outstanding balance to St. Louis Lady Cyclones will result in participant not being allowed to register for any St. Louis Lady Cyclones sponsored team, clinic, or evaluation until payment is received in full. Any player with outstanding balance from any season of play as of June 1st will be reported to Missouri Hockey and placed on the MO Hockey “no-pay” list. 4. Any fees not paid in full by advertised deadlines may result in a late charge. 5. Any and all refunds are subject to St. Louis Lady Cyclones Board of Directors approval and discretion. The decision of the Board of Directors will be final.